Showers are one of the most popular bathroom remodeling options, and it’s easy to see why. 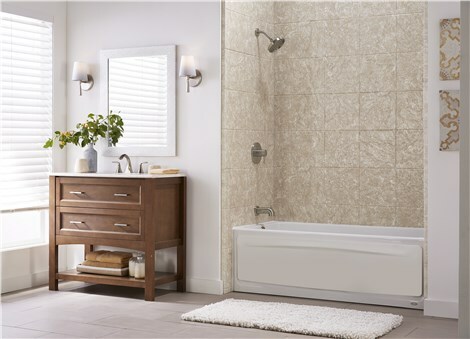 Not only do they create a spa-like feel in any bathroom, they’re also extremely convenient. After all, it’s a lot easier to hop in the shower in the morning than it is to draw a bath! The trouble is, getting the shower you want can be a challenge because many installations are one-size-fits all. If you want to get the exact bathroom remodel of your dreams, you have to choose a custom shower from Tiger Bath Solutions. Here’s why customizing a shower is such a good idea. Many showers are made to fit in any bathroom. Although that’s technically the case, pre-made shower enclosures won’t give you the spa-like feel you’re going for. A custom shower can be ordered in any shape and size. As a matter of fact, the professionals at Tiger Bath Solutions will measure your bathroom and create a custom liner that fits like a glove right into your existing space. It’s important that you get a shower that first your space just right, but it doesn’t matter how good it fits if it’s ugly! With a custom shower, there are very few restrictions on your creativity. A shower fromTiger Bath Solutions comes with dozens of color and pattern combinations to choose from, ensuring you can design a shower that fits the décor of your bathroom. Want to install a special shower head? Or maybe you want an extra soap caddy? No matter how you want to accessorize your shower, we can make it a reality! We make shower replacements fast, easy, and fun. We offer financing options that make our showers more affordable, and we can even complete your installation in just one day! To learn more, or to request a free estimate on your custom project, give us a call or fill out our online form today!